This week I spoke with Brian McKim, a comedian that has been a fixture on the national stand up scene for years and founder of Shecky Magazine. We spoke about interviewing a fictional dog, how drugs got him to the stage, and what it is like having your wife on the road. Andrew: First, tell me a little bit about Shecky Magazine. How it came to together and where it is headed? Brian: April 1, 1999, we launched it, but the genesis started the prior December. We got a little bit of Christmas money, back then scanner’s were about a hundred bucks, and we had always wanted a scanner. We got a bunch of weird crap in one room, just boxes of stuff we had collected from our years in stand-up comedy. We thought let’s scan it, put it up on-line and put together a little museum in honor of Philadelphia comedy. Then we said hey, why stop there, why don’t we just put up a website that is devoted to stand-up comedy. We said let’s interview people and have columnists, then we launched our first issue. As it evolved, we noticed that we had started putting stuff up on a near daily basis, so we started blogging before blogging was cool. Then we officially started the blog June of 2004, and we put stuff up there whenever we feel like it. At one point we had nine columnists, it was unwieldy, but it was great because there was nothing else like it on the internet. We did interviews with people like Richard Lewis, Shelly Berman and Mitch Hedberg. We were the first publication on or off the internet to interview Triumph the Insult Comic Dog. Brian: It was great. It was lots of fun. We interviewed people like Woody Woodbury, Bill Engvall, Jackie Cashin and just dozens and dozens of stand-up comics. Andrew: How did you come up with the name Shecky? Brian: Well, Shecky as we always tell people, has become a generic term, it is part of the culture, it designates anybody who is a wiseguy. Of course it comes from Shecky Green, who at one point was the most famous and most highly compensated stand-up comic in America, back in the early sixties. He was the headliner in Las Vegas and appeared on TV shows and on dramatic television shows. He was an actor and a stand-up comic and personality and he is the indirect inspiration. Andrew: Now, tell me about your own writing style for your own stand-up act. Are you somebody that pen and paper’s a joke prior to going on stage or do you take a premise up and then work it out to find your punch-lines? Brian: It’s a combination of the two. I will think of a paraphrase or a word play when I am driving down the street, and then hope that I will write it down before I forget it. Then I will go up on stage with that in mind. You do this for so long, at least you do it with the set-up punch-line style that I have developed, that the jokes pop in your head almost fully formed and then you go on stage and do it that way. It usually works. If it doesn’t work, then you tweak it here and there. Quite often, what happens is that I will will do a joke as I envision it, then I will add something to it as I am on stage. You do a lot of the writing off stage and then you do some of the writing on stage. That has been working well for me. Andrew: What advice do you give to someone who is brand new to the art form? Brian: My wife Traci and I have always told comics to watch as much live stand-up as you can, but particularly go and see live stand-up. We would always ask at these seminars, who here has been to a stand-up comedy club? We were shocked by the number of people who hadn’t been. We tell them go out and see live stand-up and if possible stay and see the same show twice in one night, and if you can stay and see the same show four nights in one week. Nothing will open your eyes more than seeing the same stand-up comic do the same set four times or do a show four times. It was an eye opener for me. The first time I ever saw a stand-up comic do the same show twice I was like “of course!” I realized they don’t always do something different every time up. There is a certain core to their act that is the same and then they take it from there. So it was enlightening. Andrew: How would you characterize your own style? Does politics get into the act? Brian: I have often been compared to Steven Wright and Mitch Hedberg. I can’t argue with that. I’m also like Jackie Vernon, but nobody remembers Jackie Vernon. I just did a gig recently at a record store, here in Jersey, and on the way out I happened to mention I was a huge Jackie Vernon fan and they just so happened to have a huge comedy section, all on vinyl. There was a Jackie Vernon album they let me have and I am in the process of digitizing it right now. I am going to put it on an MP3 player and listen to it. I remember him from his appearances on the Ed Sullivan show and various other variety show’s of the sixties. He’s been sort of a sub-conscious inspiration to me and I really admire his stuff. As far as politics are concerned. I do a few political jokes here and there, but nothing extensive. Also, I do corporate gigs, I have a page for my corporate work, I used to have a sign up there it was a red circle with a flash through it that said no political humor, because I think if you want to do corporate stuff, I think it is important that the clients know that they aren’t going to open themselves up to a rat’s nest of some sort of political comedy. I think that is a little bit risky and dangerous. There are very few people that can do stand-up comedy that centers on politics that can manage to avoid offending. Mort Sahl is one of them. Mort Sahl is a genius. I saw him about three years ago at the State Theatre Easton. It was tremendous. Andrew: I have been lucky enough to interview him twice. He is one of my favorite interviews. Why stand-up comedy or comedy in general? Brian: I often tell people the reason I got into comedy is drugs. Brian: I say that because late 1980 I was diagnosed with hyperthyroidism and one of the medications they gave me was to regulate my heartbeat. About a year later I found myself on stage in Philadelphia at an open mike night at one in the morning doing stand-up comedy, where as I had never been on a stage before in my life. Then years later I found out that the drug they had given me was popular among performers and artists in New York & Los Angeles and other major performing centers, because allegedly there was a great market, people were trafficking this drug and they would take it before auditions because it would help to calm them down, so apparently part of the reason I was able to do stand-up for the very first time was because I was taking an MAO inhibitor. I was unaware of it at the time. It always seemed kind of strange to me. Andrew: What was the name of the inhibitor? Brian: It was called Inderal. I often site that as the reason as to why I able to go up there. Otherwise, I think I would have been a mess. I always had an aversion to addressing a room full of strangers prior to that, as does a vast majority of the population. I got up and I loved it. I mean I had always been a fan of stand up comedy. In fact I had attended a stand up comedy club probably three times in the year or so before I eventually mounted the stage myself. So there was always an affinity for stand up there, but I had never imagined myself doing it until I found myself on stage. Ever since then I progressed really rapidly and back then there was a lot of opportunity to get on stage there was a spectacular market in Philadelphia for a budding stand up comic and I count myself very fortunate to be in that place at that time. Andrew: Have you ever been in the room when someone was doing your material and if so, did you confront them? Andrew: Can you tell me a little about the road and does it drain on you, is it something that you love or hate? Brian: Its a great experience, its also exhausting at times. I am one of the most fortunate stand up comics in the world because I can do the road a lot with my wife who is also a stand up comic, Traci Skene. So I often say I don’t really know if I would be a stand up comic had it not been for the fact that she started as a stand up comic in 1985 and progressed rapidly and became a road worthy comic in short oder and so we moved to LA in 88 and we pretty much had been working together on the road and maybe 90% of the time we were together on the bill, so thats been a tremendous help. The road is a blast if you have the right attitude and if you have the right companion on the road, its been fun for us. We performed in all fifty states and three Canadian Provinces. So its been quite the education and quite fun. Andrew: Can you talk to me a little bit about The Comedy & Magic Club as compared to other venues that you’ve performed in, good or bad? 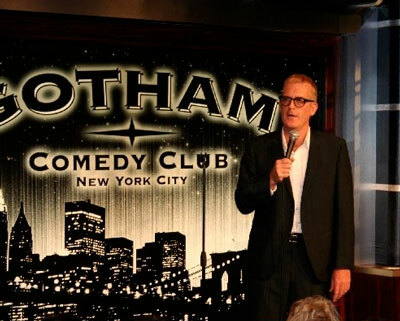 Brian: Well, [laughs] we said to the magazine, that if heaven had a comedy club, it would be The Comedy & Magic Club. We said that without a hint of irony. It’s just that I don’t know, Comics feel as if they are welcome there, and you say well Gee, shouldn't that be the rule at all the other clubs and certainly it should, but sadly it isn't and happily it is at The Comedy & Magic Club. When I walk through the doors there I feel as if my contribution to the whole thing is valued and I’m welcome there. I view it as my home when Im in Los Angeles and its been invaluable to me both as an emotional thing and as a tool for becoming a better stand up comic. Im pretty sure its the best club in America, I haven't played every club in America, but I don’t see how any club can be better. And the crowds of coarse, the crowds are just exceptional.